The paddy fields in Dillai area under Bokajan sub-division in Karbi Anglong district has come under “severe pest attack” – ‘Army Worm’. The Agriculture Extension Assistant (AEA) staff of Agriculture Department (Government of Assam) inspected the paddy fields to assess the damage caused by the pests and subsequently insecticides were sprayed. 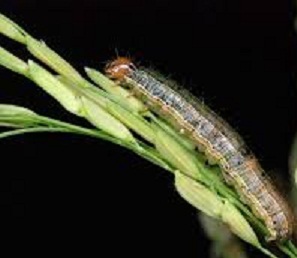 The Senior Agriculture Development Officer P Daimary informed that last year a huge area of paddy field was infested by the “paddy-swarming caterpillar or the army caterpillar damaging standing crops and eating away the tender leaves of paddy”. Daimary urged the farmers to inform the Agriculture Department authorities in Karbi Anglong pronto if they noticed “paddy swarming caterpillars” so that the department can “initiate preventive measures” immediately. “Floods provide congenial conditions for the pest’s growth,” observed Daimary. Swarming caterpillar is a nocturnal pest; it becomes active in the night while hiding in the cracks and crevices in the soil, making it difficult for the farmers to spot the damage in the initial stages. Experts say that farmers do not monitor their fields regularly after planting like they used to do earlier which could prevent much of the damage by any pest.